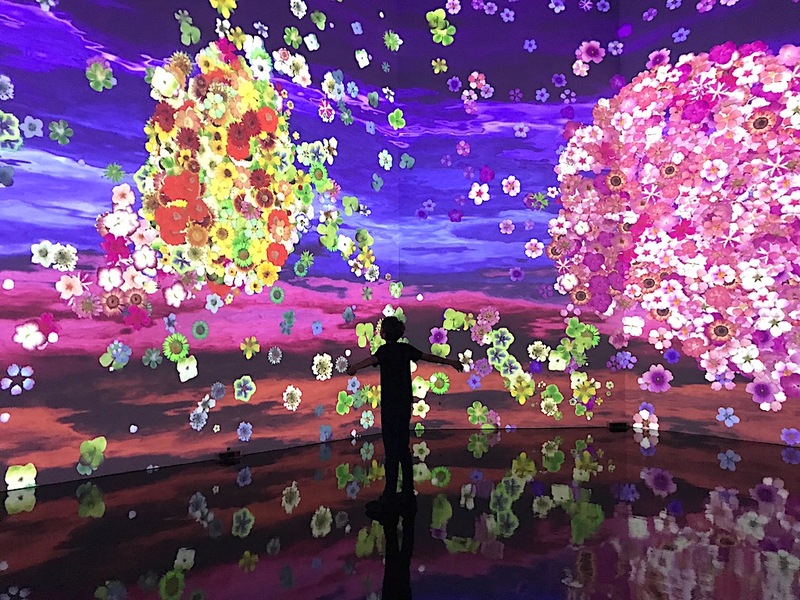 The newest digital art exhibit at ARTECHOUSE, the gallery in Southwest DC known for its fusion of art and technology, may just be my favorite yet. 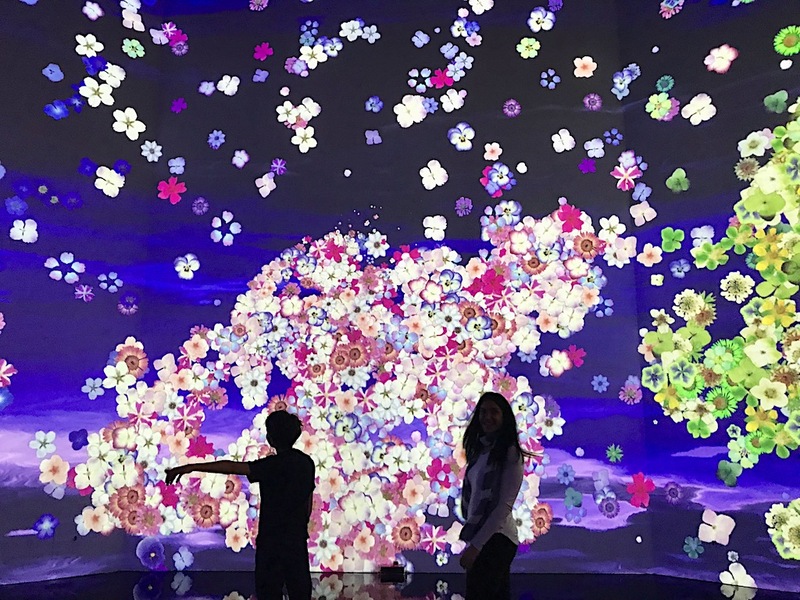 Perfectly timed to open on the first day of spring, In Peak Bloom is a fantastic celebration of the season and its beauty, and visitors are encouraged to join in through interactive works that are delightful and enchanting, unique and profound. 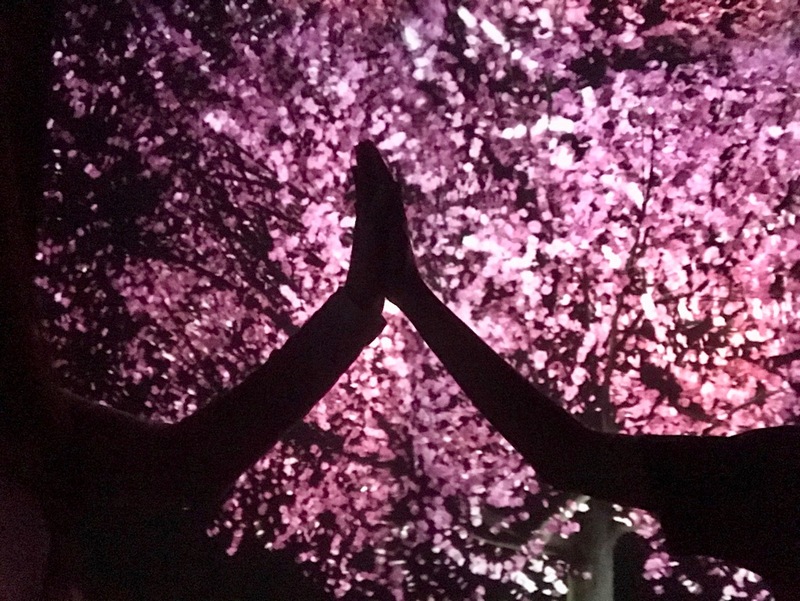 Of course, cherry blossoms are featured in some of the installations. 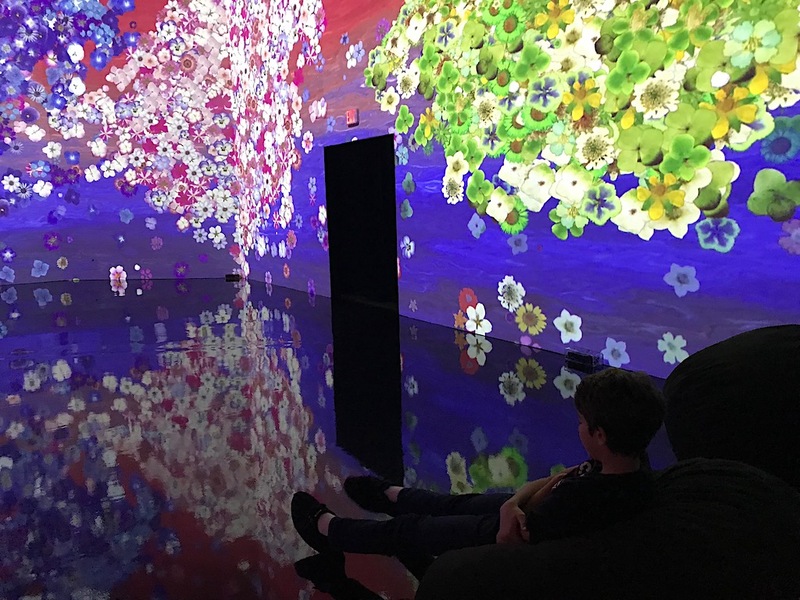 Digital projections of the flowers float along the walls of the main room along with other vibrantly colored blooms. 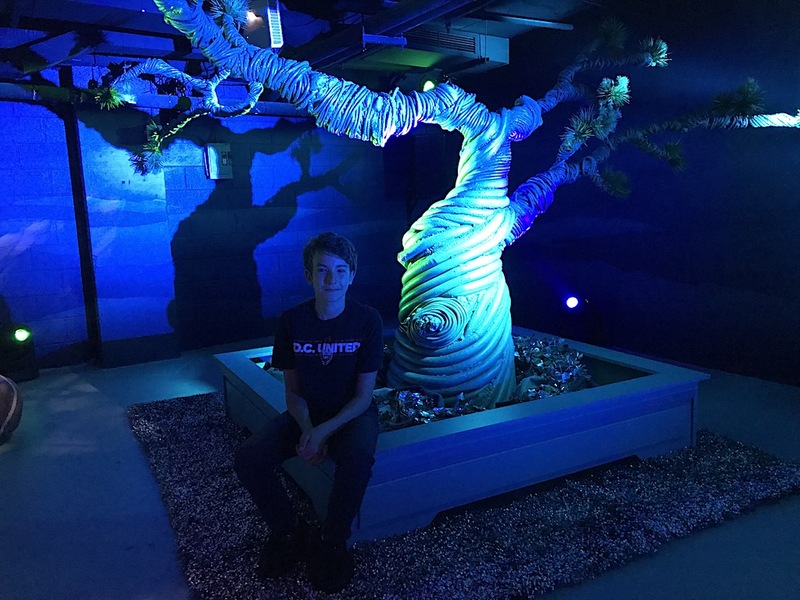 Like many of the works at ARTECHOUSE, you can engage with the imagery, directing it back and forth and in swirls as you move your arms. Owen looked like a conductor as he stood in front of the floral scenes waving his hands around. And the floor painted a glossy black looks like water with images from the walls above reflected on it. It’s quite a stunning scene to take in from the balcony above or even standing (or lounging) within. 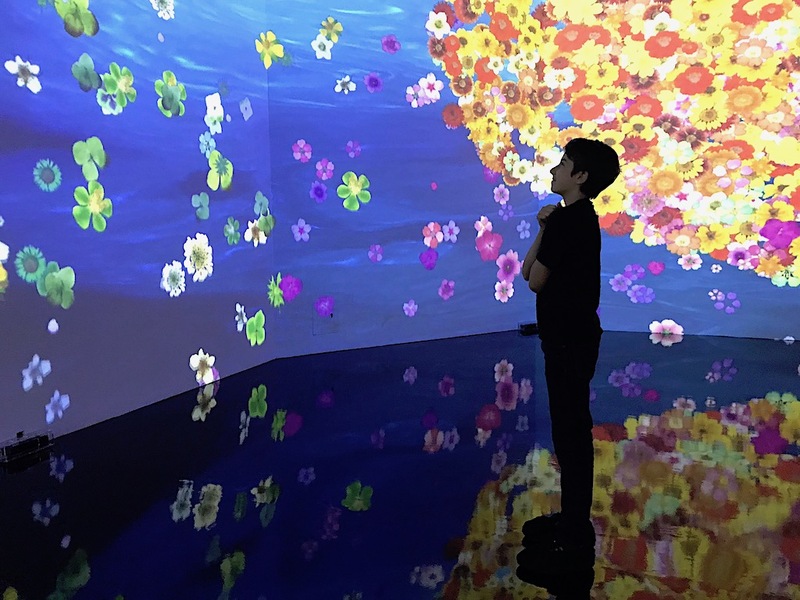 In a smaller room, you can make an image of a cherry tree bloom through connection with others. 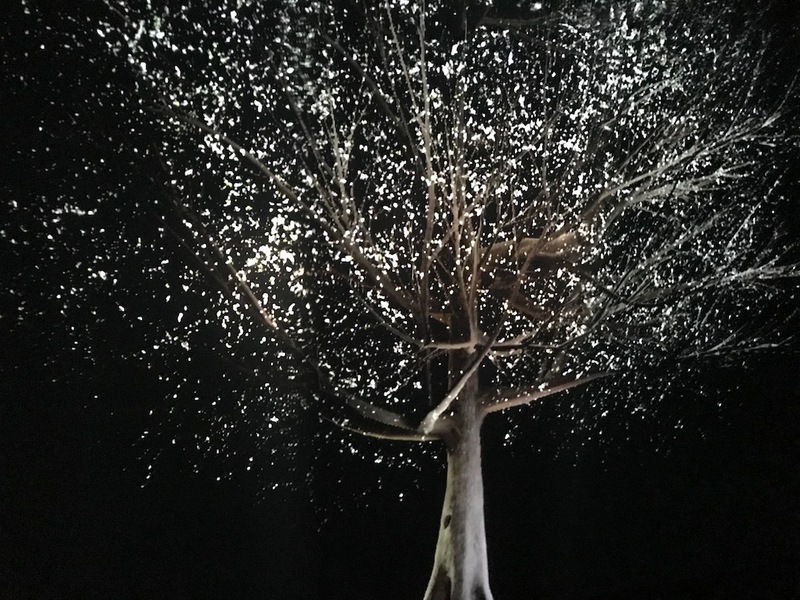 Powered by biometric sensors in four circular pads on the floor, you stand on one while other people stand on the rest, and touch hands (or lock arms or hug), and the tree goes from a pre-bloom white to a flourishing pink. 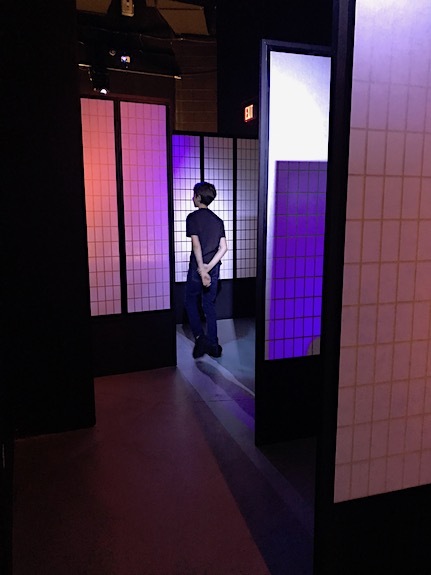 Created by Korean-American artist Lisa Park, the work is inspired by Park’s experiences living abroad in the US and feeling detached from family and friends back home in Korea. 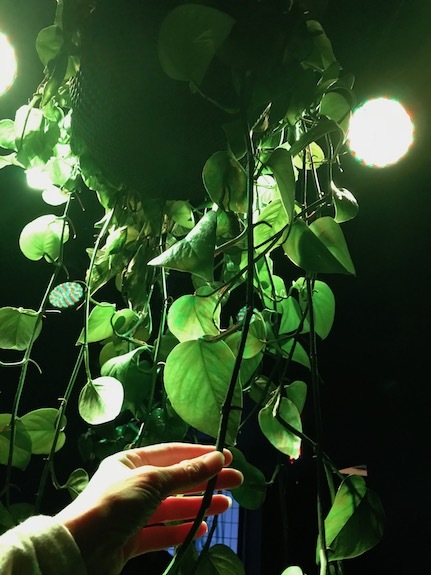 It shows how connection and physical contact between people helps them thrive. 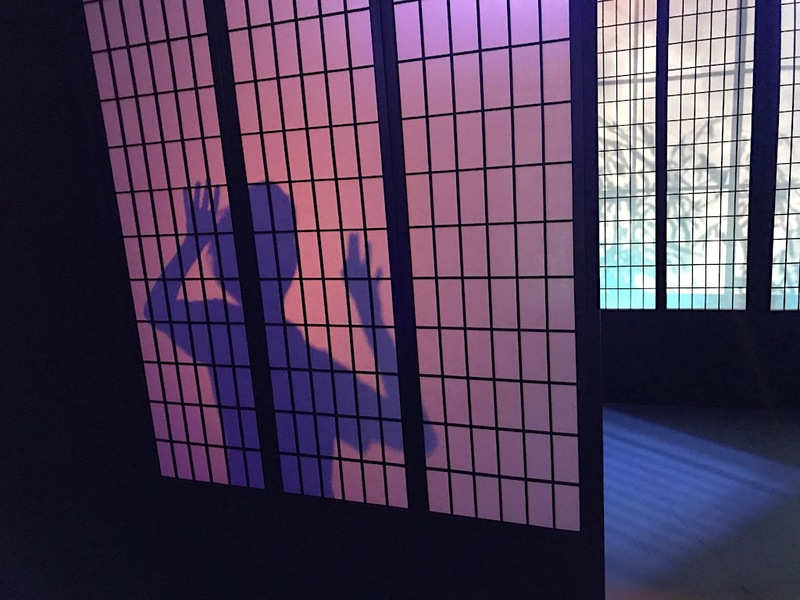 The maze of shoji screens leads to a wonderful, wild installation of “musical” plants, three planters of live hanging ivy that respond to contact. 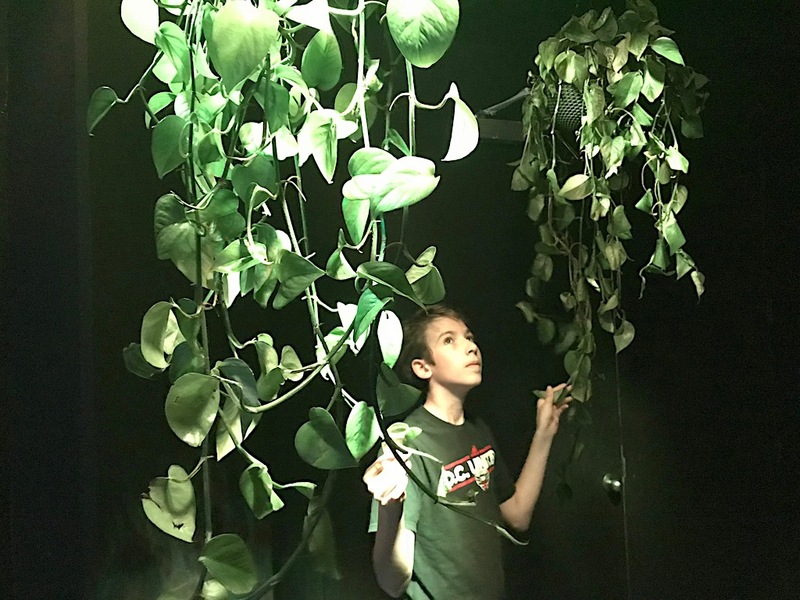 Each plant makes a different sound from nature — tweeting birds, croaking frogs, and either chirping insects or chattering monkeys (I couldn’t quite tell). You walk below and gently touch a leaf or stem to hear them sing. And multiple people touching them is like a little symphony of nature. 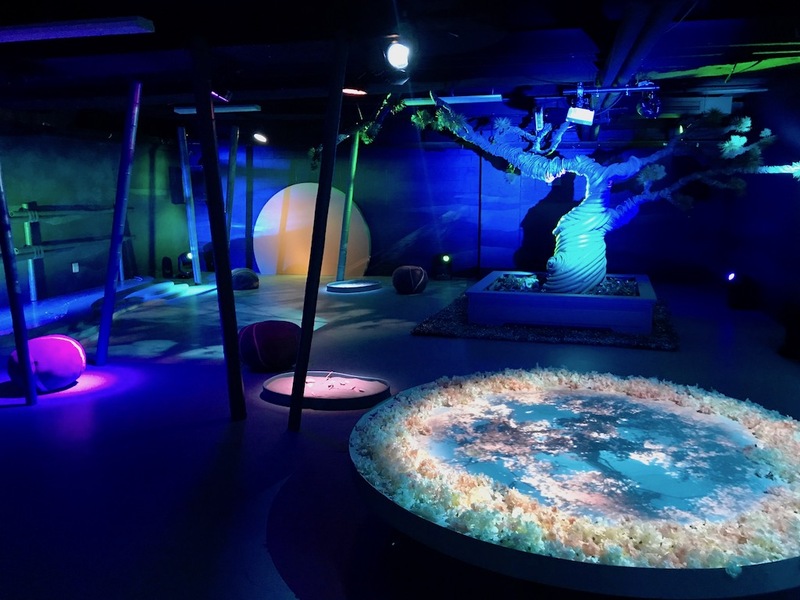 Finally, there’s the Enchanted Garden, a room full of whimsical designs created from a mix of natural and recycled artistic mediums. 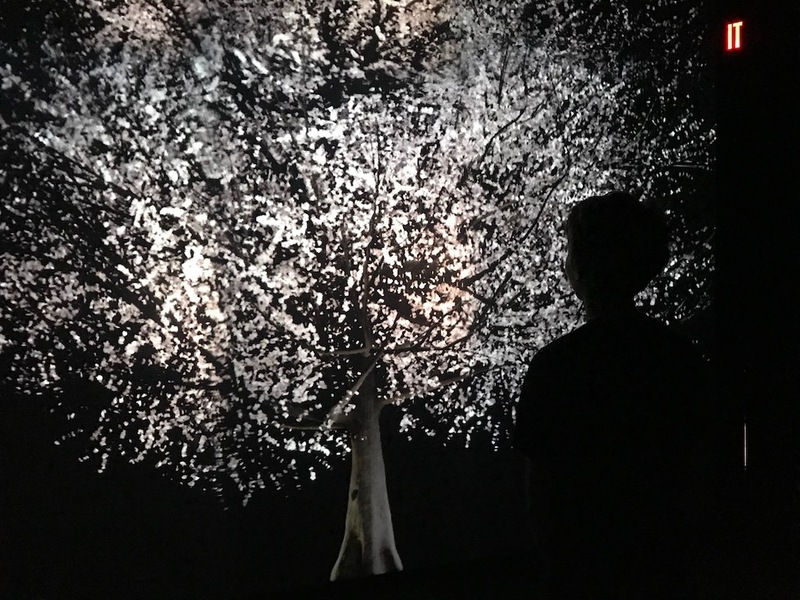 An augmented reality (AR) app accompanies the installation to tell the story of The Rabbit in the Moon, a legend from Japanese folklore. Right now, it’s only available on android phones, and there are a couple available there to access it. The AR will be available on iPhones soon. But even without the AR, it’s neat to wander around and explore details of the art. Put In Peak Bloom on your family’s must-do spring activity list — it’s one you’ll all enjoy! Kids are welcome during all-ages daytime hours, but evenings are for adults only. The bar is open during these hours, and ARETCHOUSE always serves unique and tasty exhibit-inspired cocktails. Great Write-up. Looking forward to the exhibit. Do you happen to have the details of the app? Hi Ginger – The AR story should be part of the Artechouse app. But if you have an iPhone it won’t work for another week or so. Great Write-up. Looking forward to the exhibit. Do you happen to have the details of the app? Thank you!